Monday night: Mostly cloudy with patchy fog and drizzle, low in the 60s. Wind from the east 10-20 mph. Tuesday: Wind and rain likely southern New England to the New Hampshire seacoast. Sunshine well north. High in the 60s south, to 70s north. Wind from northeast gusting 20-30 mph at the shore late. Wednesday: Heavy rain and wind south and east. Sunny breaks well north and west. High in the 60s to low 70s. Wind from the north 20-40 mph, stronger over Cape Cod and Islands. Tropical storm warnings have been issued around southern New England ahead of Jose's brush against the East Coast. Hurricane Jose continues to churn northward Monday between the Carolinas and Bermuda and about 500 miles south of Nantucket. Although a New England landfall is unlikely – meaning the center of the storm is unlikely to pass directly over land here at home – Jose already is showing signs of transitioning from a tropical system to a hybrid. A hybrid storm means the center is no longer entirely warm core and the structure of the storm is no longer a concentric circle, which surely is evident in the latest satellite imagery. The change in Jose’s makeup becomes important because as a storm becomes non-tropical, the wind field starts to expand and the rain often shifts away from the center. Both of these phenomenon are expected with Jose. •	RAIN: Bouts of heavy showers and rain will start sweeping into southern New England as soon as predawn Tuesday, then expand across the remainder of southern New England during Tuesday morning, except perhaps western Massachusetts, which will see a later arrival of rain. The rain will fall in fits and starts into Tuesday night, before ramping up to a shield of heavy rain overnight Tuesday night into Wednesday. Half a foot of rain is possible on Nantucket, three to four inches on the Mid-Cape and about an inch of rain in Boston, with lesser amounts north and west. Especially in southeast Massachusetts and Rhode Island, these rainfall totals will be sufficient to produce localized flooding and urban street flooding, especially in poor drainage cities and towns like New Bedford and Fall River, Massachusetts. Residents in Southeast New England can clear storm drains now to assist drainage. People on Cape Cod are bracing for the impact of Jose. •	WIND: Although much of Tuesday will be breezy, more significant wind gusts capable of producing some power outages won’t really ramp up until Tuesday late evening on Cape Cod, then overnight Tuesday night through Wednesday for the South Shore, southeast Massachusetts, Rhode Island, Cape Cod and the Islands. Residents along the eastern and southern coasts of New England and all residents of southeast Massachusetts and Rhode Island should secure lightweight objects like patio furniture, trash cans and the like, to avoid objects blowing around in the wind. 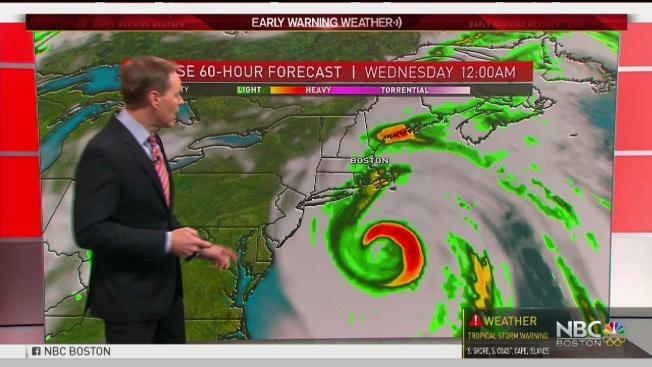 •	COASTAL FLOODING: The times of high tide – made higher by the New Moon – that we’ll watch closest will be around 11:30 p.m. Tuesday for most coasts and again at noon on Wednesday. Typically flood prone areas during a moderate nor’easter could see moderate level coastal flooding, especially along the South Coast of New England from Cape Cod through Long Island Sound. Eastern coasts are likely to find some coastal flooding thanks to the high tide and onshore flow, likely to be minor to moderate. Those along the coast in flood prone areas should make preparations for a minor to moderate coastal flood event. •	HIGH SURF AND BEACH EROSION: Waves have already increased to 5 to 10 feet along New England’s South Coast and will continue building and spreading northward overnight into Tuesday and Wednesday. Not only will these waves cut into productivity for commercial mariners, but represent a life-threatening sea to those who dare to venture into it. 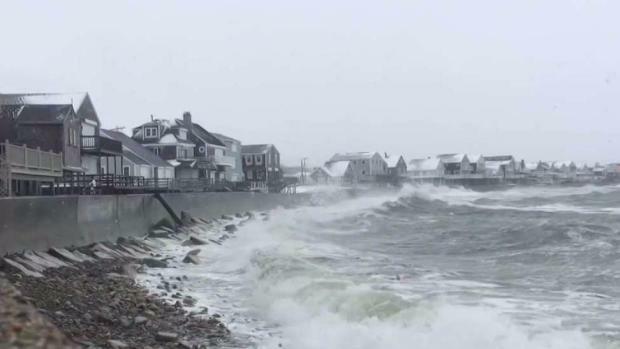 Along the coasts, significant beach erosion is expected from Cape Cod through the South Coast thanks to waves that will build 15 to 30 feet offshore, breaking as 8 to 12 foot waves on exposed beaches. Mariners should remain in port after today, and secure vessels for gusts to 65 mph from the northeast. •	SEVERE THUNDERSTORMS: Often, tornadoes can result from landfalling tropical systems, but Jose will not make landfall, and New England will not be on a side of the storm that favors tornado development, so tornadoes are not expected.